The Secretariat is responsible for organizing substantive aspects of the Sarajevo Model UN conference. 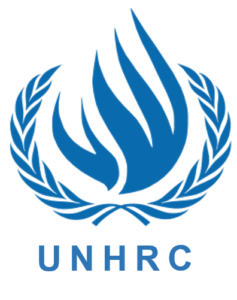 Roles include Secretary General, Deputy Secretary General, Crisis Director, Editor-in-Chief and Chairpersons/Presiding Officers. Together, the Secretariat manages the substantive part of the conference and ensures that the delegates experience the best conference possible. For inquiries related to conference topics, chairpersons and other substantive matters, please contact the Secretariat via email: secretarygeneral@sarajevomun.com. 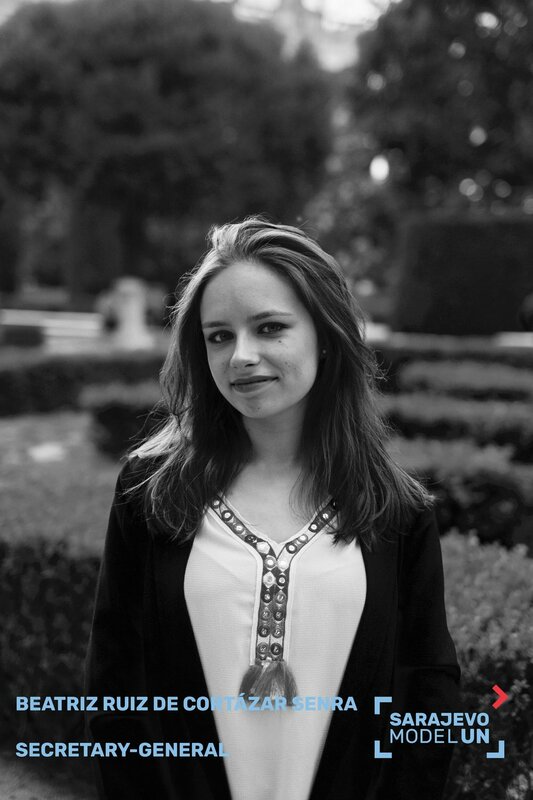 Bea is a Law student at Universidad Autónoma de Madrid. Born and raised in Galicia, a region located in northern Spanish coast, she discovered her passion for international affairs and geopolitics when she participated at her school’s MUN when she was just 15 years old. When she moved to Madrid to start her university studies, she got even more involved in MUNs participating in different national and international conference, both as Chairperson or delegate. During her “MUN career” she has been awarded several times. AUMUN 2017, Deputy-Secretary General for AUMUN 2018 and will be Deputy Director of Logistics for Harvard WorldMUN 2019. Founder, Vice President and intercultural explorer, William Wegener is a nineteen years old student studying international affairs - politics, economics and geography - in Geneva. Passionate about philosophy, Europe and geoeconomics, he has always been devoting his time to debating, because he does believe that free exchange of ideas and knowledge is a fundamental element to better, more innovative and more feasible solutions to the daily problems that the world, the nations and the citizens are facing. 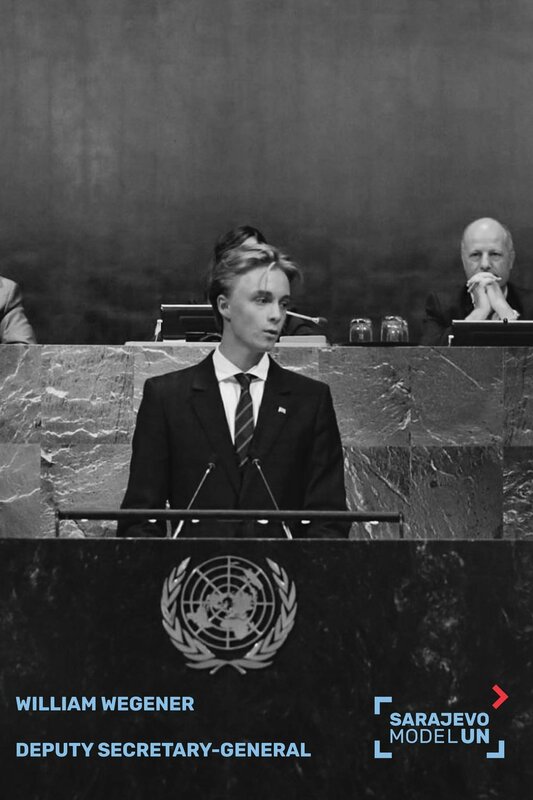 It was by pure luck that William came across a Model UN organization early last year, and he instantly seized the opportunity to participate in Model UN conferences. It certainly was an eye opener for him. William since then has devoted his time and energy to more than four Model UN in less than seven months as delegate, ambassador, chairman and today as Deputy Secretary General. Meet our Crisis Director Emir Hasanović. Emir hails from Macedonia, a country that just emerged from one of the most serious political crisis millennial Europe has seen, so he knows a thing or two about the subject matter. He is a Georgetown graduate with extensive international experience in strategic communication agencies in Qatar, Macedonia and the US. Currently he is a Special Adviser to the Minister of Defense of the Republic of Macedonia. At the conference he hopes to showcase that politics goes beyond the glamour, witty remarks and heartfelt speeches; rather, that it’s about making tough decisions under severe pressure that affect the world as we know it. I'm a student of German and Russian language and literature at the University of Zagreb. Besides that I have a basic knowledge of Italian and I'm currently attending a French course. Languages are my passion as I believe that the knowledge of more than one language opens up more opportunities and increases multitasking abilities, as you toggle from one language to another. Having a broader perspective and various sources of information is essential for keeping up with the fast-paced and ever-changeing world we live in. Sarajevo MUN 2017 was my very first conference, since then I took part in several MUN simulations as a delegate as well as a member of the press team. I was presented with two Best Journalist awards what led me to the decision of applying as an Editor-in-Chief. Earlier this year I participated in the European Green Activist Training in Brussels, what gave me a better insight into European politics and institutions. I hope to draw your attention with different means of reportingand I will make sure to keep the things at the conference interesting and spice them up a bit! Romana Pacin is a Spanish Political Science student. Born and raised in Galicia, northwestern Spain; she diversified her studies between the UK, Ireland, the US and Spain. She developed an interest in international relation and security; making her enrol in the Universidad Autónoma de Madrid to pursue her dreams within the community. Discovering MUN at a university, she has participated in many national and international models, always looking forward to learn something new and keeping her mind open to new experiences. She has been interested in eastern European and Russian culture; Sarajevo Model UN was the perfect opportunity for her to discover a new part of the Balkans and expand her horizons. Meet Sarah Wissing, Chair of the Security Council along with Romana Pacin. Sarah is a third year law student at the ULB who completed her first MUN conference in 2016. Since then she successfully took part in conferences as a Delegate and Chair in Belgium, Switzerland, the Netherlands, Bosnia-Herzegovina, China, Kazakhstan as well as in Austria. She has been awarded best delegate several times and, in September of 2017, she also became Head Delegate of her university team. You can definitely tell that she has a thing for MUN and she doesn’t seem to be able to stop herself when a good conference comes along! Fluent in 4 languages and from a Belgian and German background, her interest in international politics and international relations developed over the last few years and was only strengthened by the conferences she took part in. It has almost been a year since she took part in the last Sarajevo Model UN conference and she cannot wait for the next edition. 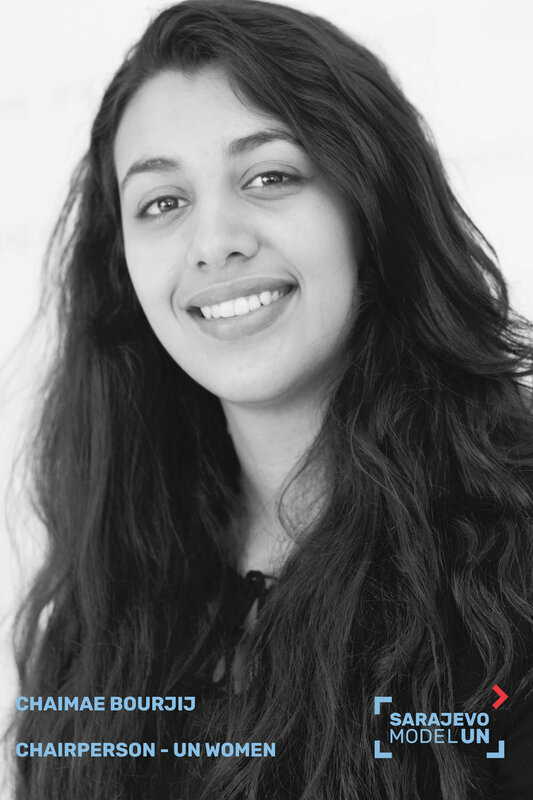 Chaimae Bourjij is the program manager at the Friedrich Naumann Foundation For Freedom in Morocco since January 2018. Previously, she participated in several international symposiums on topics of current political order, including: democracy, the Sustainable Development Goals and intercultural exchange. This young leader being a passionate advocate for women's rights has continuously contributed in building the capacity of young women leaders through initiatives such as the Sustainable Development’s Youth association she founded last year which won mobilizer of the year 2018 for SDGs by the UN SDG Action Campaign. Her great interest in debate led her to be certified as a debate coach by the United States Embassy and The Great Debaters Morocco in 2016. Later, she won the United Nations COP22 Best Delegate Award, thus representing Morocco in Germany at the Münster International Model United Nations. The latter has also chaired, coordinated and intervened as a consultant expert on simulation on various occasions. Her commitment is intended to familiarize young people with decision-making processes and strengthen their capacities under the aegis of democratic governance. Jovana Malinović, was born and raised in Gradiška, Bosnia and Herzegovina. She is currently living in the capital of Serbia, where she’s studying judicial- administration law at the Faculty of Law, University of Belgrade. 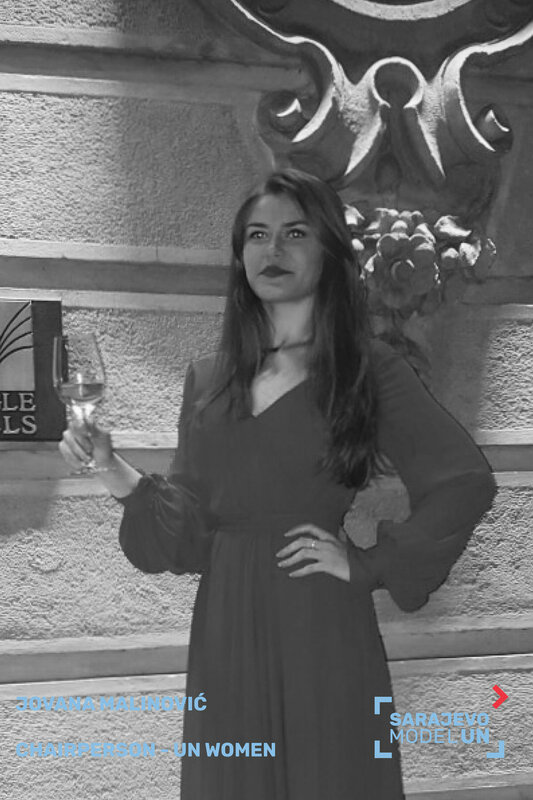 In a very short amount of time, Jovana has managed to build a name for herself in the MUN/MEU world, joining many prestigious conferences as delegate, chair, and even Secretariat member. Her dream is to become an international criminal lawyer, and build her career worldwide. She’s a part of many distinguished student organizations such as UN Club of the Faculty of Law, ELSA, OSSI etc. She is very happy to be able to bring her special set of skills to Sarajevo MUN, to visit Sarajevo once more and meet all of you! Kevin Lechner is a student at the University of Vienna. He studies Romance Studies and African Studies and is very interested in languages. His first MUN experience was in July 2017 – where he participated at the Middle East and North African Model United Nations as the delegate of Oman in the Arab League. Besides his Studies at the University he is interested in politics and global affairs. Since December 2017 he is honored to be the Chair of the Vienna Model United Nations Club at the Academic Forum for Foreign Affairs in Vienna/Austria. Simone Mostratisi is an Italian student of international relations in the university of Turin, a city in northern Italy, and he will be an Erasmus student in the Universidad Autónoma de Madrid during his third year. He has also lived in the United States for a while, where he was able to attend high school and where he kept practicing foreign languages: now he is fluent in French, English and Spanish. In addition, over the past 5 years, he has taken part in several simulations, both around Europe, and in the USA, and he has been awarded several times as best delegate. Moreover, his passion for international affairs and sports brought him to take part in an international Hackaton in Rome about sport and human rights, where his wonderful team and him won the first prize. He is really looking forward to seeing you all in Sarajevo. 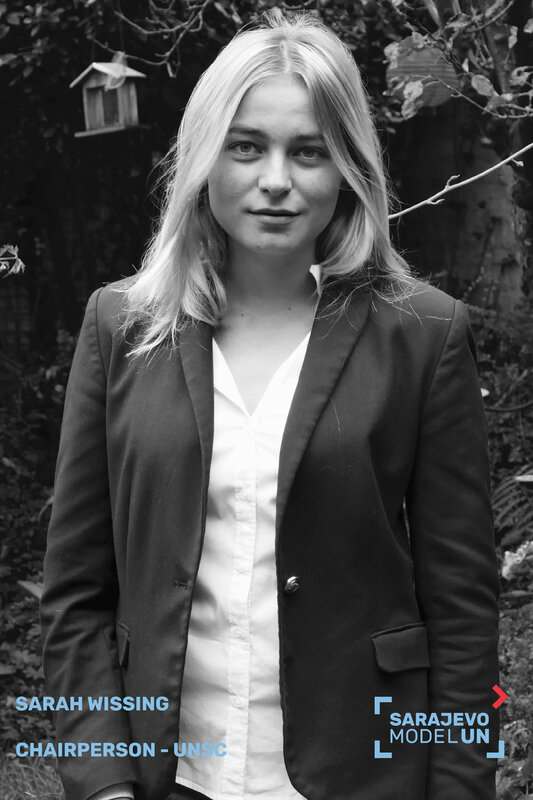 Julia Chiloeches Torrecuadrada is a student of Dual BA in Law and Political Science at Universidad Autónoma de Madrid. Her experience with MUN begins in 2014 when she participated in MFGNU in Grenoble, France. Since then, she has participated in several MUN both in Spain and internationally, winning several awards as well. Versatile and committed delegate, during this last season she has represented a wide variety of institutions and states such as the Holy See, USA, Israel, Sierra Leone, Bolivia or Ivanka Trump in really different internal and external committees such as UN Women (COMPIMUN 2016), IMF (UC3MUN 2017), UNESCO (URJCMUN 2017), WHO (LIMUN 2018), BILDERBERG (COMPIMUN 2017) or Security Council (UC3MUN 2018). She is highly involved in the MUN Society of her college, UAMIMUN, serving as the Secretary of the association during the 2017/2018 season and has taken an active role organizing AUMUN as the USG for Application for AUMUN 2017 and Secretary General for AUMUN 2018. Tarik Kreso is a Bosnian student who fell in love with Model United Nations after his very first conference, where he represented France at the Historical Security Council and was awarded as a Best Delegate. Apart from his deep interest in politics and business, Tarik is fluent in English and German since a very young age. His goal is to wake up political awareness in all and one day perhaps be a part of the European political scene.